A plant-based diet has many benefits for older adults who are trying to boost their health. 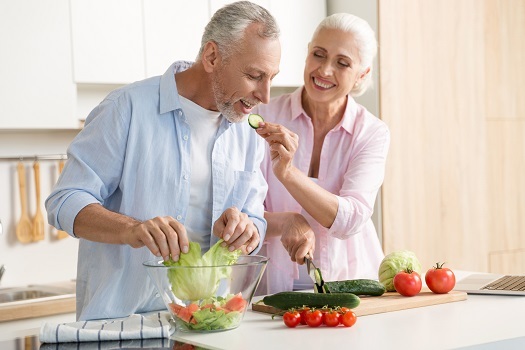 Your senior loved one’s doctor may recommend this type of diet to control high blood sugar or maintain a healthy weight. While people who choose this diet tend to report happiness over time, it does take some adjustment to cut meat and processed food out of the diet. These five tips make it easier to switch so your loved one is successful at modifying his or her eating habits. Many people fail at switching their diets because they try to do it all at once. However, cutting out everything a person loves to eat only increases the cravings. Try having your loved one pick out one or two favorite plant-based dishes to start eating more regularly, such as oatmeal or vegetable soup. Then, gradually add in more meals until he or she is eating plant-based dishes all the time. Some family caregivers may not have enough time to help their loved ones prepare healthy plant-based meals. In Montgomery, in-home care providers can benefit aging adults in a variety of ways. From cooking nutritious meals to offering timely medication reminders, the dedicated caregivers at Home Care Assistance are available to help your elderly loved one 24 hours a day, 7 days a week. There are many types of meat and cheese substitutes that claim to be healthy. However, these often have just as much sodium and fat as processed foods. Always read labels, and make sure the food your loved one eats comes from whole and natural sources. For instance, you can use Portobello mushrooms in place of meat to provide similar textures and more flavor to your loved one’s meals. Your loved one should never feel deprived when it comes to food, and he or she should feel comfortable accepting social invitations. Let your loved one know it’s okay to occasionally have something that isn’t included in the plant-based diet. However, he or she should remember to keep the portions small. For instance, your loved one may want to have a tiny sliver of cake to celebrate a birthday. Enjoying an occasional food that isn’t plant-based is fine as long as your loved one sticks to the diet the majority of the time. One roadblock many people come across with a plant-based diet is that it takes more time to prepare meals. After all, it takes only a few minutes to stop by a drive-through or heat up a microwave dinner. Help your loved one start chopping ingredients for meals in bulk, or arrange for someone to handle the meal prep if your loved one cannot cut up foods easily. This way, all your loved one has to do is pull the ingredients out and follow the recipe. If you have other responsibilities that make it difficult to address your loved one’s dietary concerns, consider hiring an in-home caregiver. Montgomery respite care professionals can assist seniors with a wide array of daily tasks, offering family caregivers the chance to focus on other personal responsibilities or take a break to prevent burnout. Whether it’s for a few hours a day or a few days a week, respite care is the perfect solution for family caregivers who are feeling overwhelmed. The best thing about a plant-based diet is that it never gets boring. There are so many recipes out there today that your loved one can try new dishes several times a week. Grab a recipe book or show your loved one a website online with recipes for plant-based diets. Then, encourage trying a new recipe once a week to keep the new meal plan exciting. Following a plant-based diet can help older adults manage or prevent a wide array of serious health issues. There are a variety of age-related health conditions that can make it more challenging for seniors to live independently. However, many of the challenges they face can be easier to manage if their families opt for professional senior home care. Montgomery families can rely on expertly trained caregivers to keep their loved ones safe and comfortable while aging in place. To find out more about the premier home care offered by Home Care Assistance, call (334) 593-3988 today to schedule a complimentary in-home consultation.